Join the discussion on our forums! Come discuss Smolderthorn Lancer over in our dedicated Smolderthorn Lancer discussion topic. Have tried making a dragon warrior deck with this card replacing Execute. 4.) It is only playable within one archetype of one class. Maybe I'm wrong and 8 forms of spot removal in Dragon Warrior will be the way to go - 2x Execute, this guy, the new 7/4 dragon and Shield Slam. 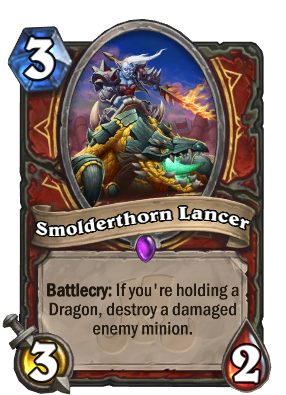 I don't think Odd Dragon Warrior is a thing, and I see this card more like Execute 3 and 4. The dragon restriction is holding this card back. Probably won't see play I assume. Give me more dragons. NOW. NOW. Tempo dragon warrior was one of my favorite decks ever. It will be really cool to play it once more. The thing about Odd Draon warrior is...what are your execute activators. Like, just in general, how many effective activators do we have right now? Warpath would feel like a waste, and Whirlwind is useless in any other context. Don't think a tempo deck would run Inner Rage at this point. I think it's a bit too early to say that Dragon Warrior is a thing yet, but since this is odd and so is Ysera and Alextraza, I think this will still see some play. Except the tease implies that we're going to see a Dragon package out of warrior this expansion. Dragon Warrior -- This time for real, you guys!